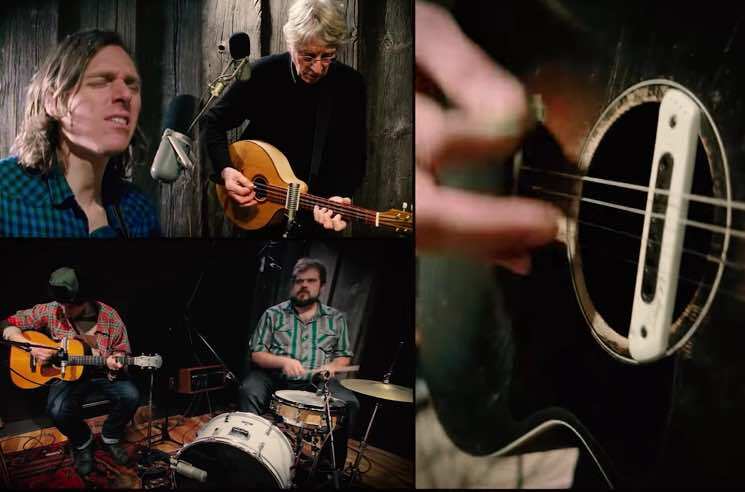 The father-son duo of Bill and Joel Plaskett teamed up to put out their Solidarity LP earlier this year, and now they've unveiled a live video for album cut "The Next Blue Sky." The East Coast singer-songwriters previously explained that the track is an ode to the ever west-looking mentality of Maritimers, who often leave home "chasing some work, a safe haven, or the next blue sky." A journey west is also what brought the Plasketts together with Ontario folk ensemble the Mayhemingways, who accompanied dad and son for a live session that was captured on film by producer Michael Phillip Wojewoda. "MPW did a great job capturing this live performance of 'The Next Blue Sky,'" Joel Plaskett tells Exclaim! "It was recorded and filmed at Revolution in Toronto with Peterborough's stellar Mayhemingways as our back up band and offers a preview of the sound of our tour together. This song is close to my heart these days. Farewell to Nova Scotia while we hit the road, chasing the next blue sky." You can catch the Mayhemingways on tour with Bill and Joel Plaskett at the upcoming shows listed below. Beyond those, hit play to get a sneak peek at what they sound like together in the video for "The Next Blue Sky." Bill & Joel Plaskett "The Next Blue Sky"